Magicard Enduro+ single-sided color printer with USB interface and 2 year warranty. Comes standard with Magicard patented Holokote visual security feature.as the ability to be field upgraded from single to double-sided printing with simple drop-in upgrade kit. Note: This product has been updated to a newer model. Please click here to visit our Enduro3E page to view the updated models. The Enduro+ 3633-9001 offers you total flexibility, with unique drop-in upgrades that instantly enable duplex printing and Ethernet connectivity. You can batch print, hand-feed, or even use rewritable cards. The Enduro+ comes standard with Magicard's patented HoloKote anti-counterfeit visual security feature. 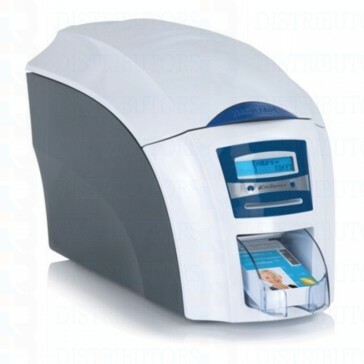 The Enduro+ is trusted for ID issuance of employee ID, education, membership, healthcare and event cards..
instantly enable duplex printing and Ethernet connectivity. Single/double-sided The Enduro+ is a single-sided printer which can be easily field upgraded to duplex printing by means of a simple drop-in upgrade.The Enduro+ Duo is pre-configured as a duplex printer. Print speed 35 seconds for color and 7 seconds for monochrome.